Suddenly realising there was no festive pudding for Christmas Lunch tomorrow, I resuscitated a recipe for something I used to make for my Dad. It smells glorious so hopefully tomorrow will be met with approval by his grandson and family! 8. Remove the pie from the tin by standing the base on a tin of beans or something similar. My Dad always loved this with tinned cream, the kind you have to shake in the tin until it is almost solid, but I am serving it tomorrow with a choice of double cream or indian kulfi (Ice cream) My Mum would have wanted custard made with Bird's custard powder... I probably still have some in the cupboard somewhere! 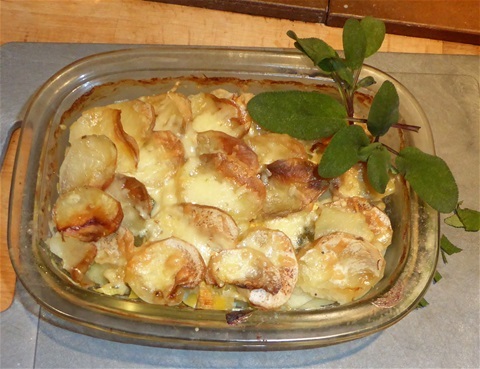 Another potato dish, this time a hearty, oven baked one, just right to accompany sausages! It gets its name from a traditional dish cooked in France, where the heat of the oven in the village bakeries is used after the bread has been cooked, to bake this.. Boulangerie is of course the french name for a bakery. The original version used onions, rather than leeks, and I have added cheese, which I don't think would have actually been included in the original recipe but certainly tasted good! I used waxy salad potatoes, so the finished dish had clearly separate pieces of potato through it, but using a floury variety makes the result softer overall. 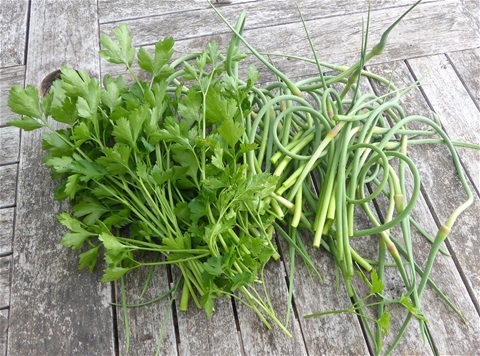 You can use different herbs: thyme is good with the leeks for example, or marjoram also works well. It depends on what you intend the dish to accompany really. 1. Put the potato in a bow and re-mash, to loose it a bit. 4. Break the dough into six equal balls, and flatten them gently until they are just about 1cm thick in the middle. 7. Bake for 2- 2½ hours. 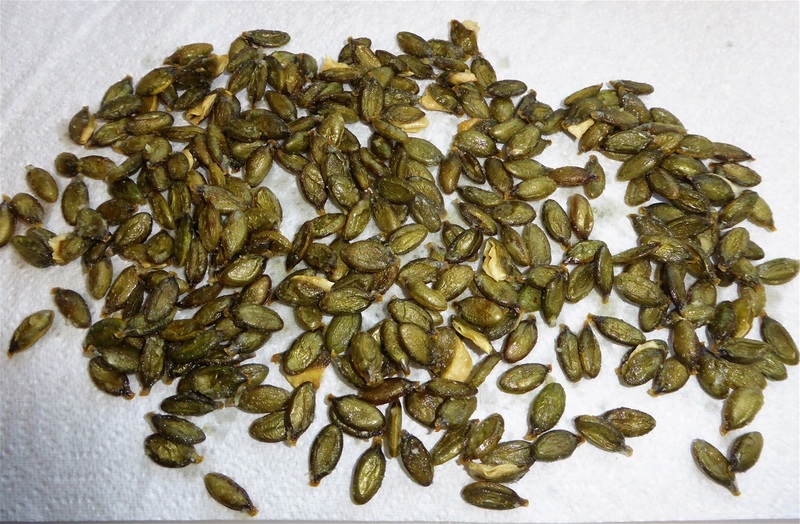 Last year, for the first time, we grew a variety of pumpkin with naked seeds, one which has no hard seed coat, and they were so delicious we just ate them raw. This year I roasted some, and they were very more-ish indeed. Well worth the small effort, and it meant they could be stored for a while too. To be honest, they only lasted a few days, as they were in a dish out on the worktop, so grazing was far too easy! 2. Put the dried seeds in a bowl, add the salt and oil, mix well with your hands. 4. They will be slightly crisped when done... careful, they are very hot so do not burn your mouth! 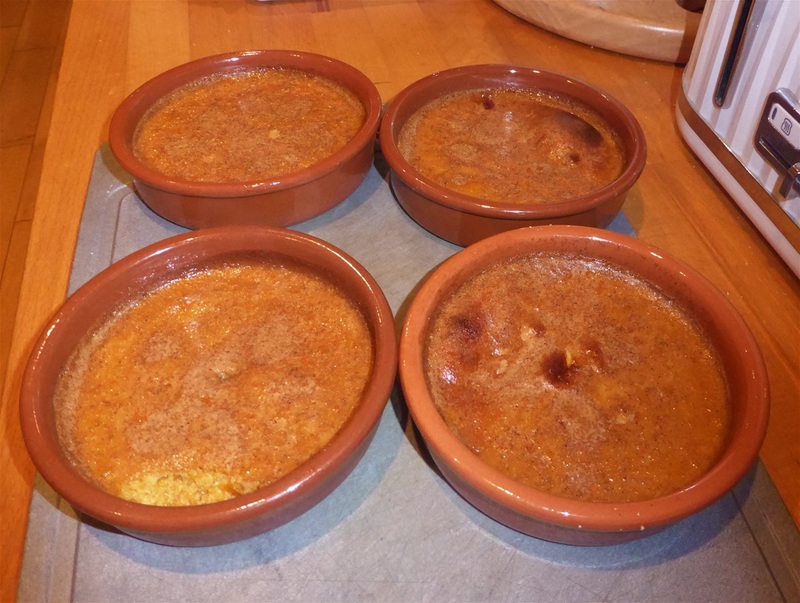 I have never made a sweet dish with squash of any kind, but was intrigued by this recipe, which is based on one from Dave in the US. It turned out to be really luscious. It could have done with being in slightly deeper dishes, but I used what I had: 11-15 minutes less cooking time would have allowed them to set with a "wobble", but we liked them anyway! 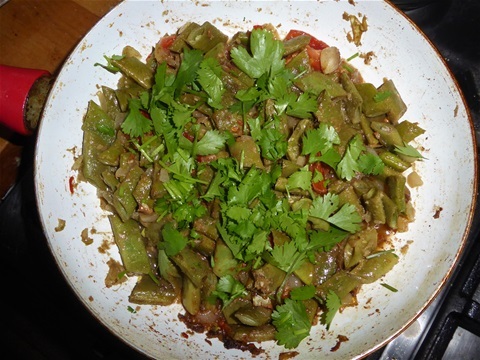 Eventually the time comes when you really need some other way of cooking runner beans, so last night we had this: Runner Bean Bhaaji. It is not like an onion bhaaji, which is chopped onion fried in spicy batter, but a dish based on a spicy tomato and onion stew. We ate it with plain rice, but if it is made slightly thicker with longer cooking, it would be good with chappatis too. 8. Cool on a wire rack. These will store in a tin for a couple of days, and stay moist. 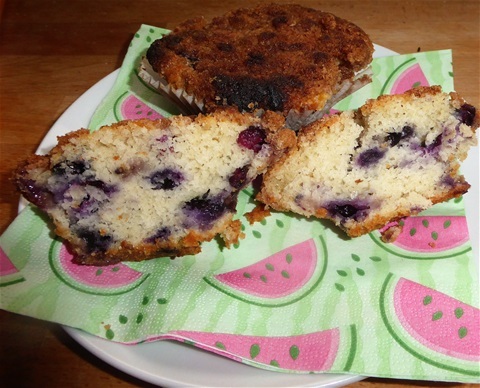 As I have used all our blueberries now, the next batch will be raspberry, and with a proper muffin tin, they should be a more tradtional shape! This is a very quick recipe, which is easily adapted by using different fruit ... chopped apple and black berry would be good..and you can vary the flavour of the topping, using a few drops of vanilla or lemon oil, nutmeg, mixed Christmas spices, ground allspice, or leave it plain. 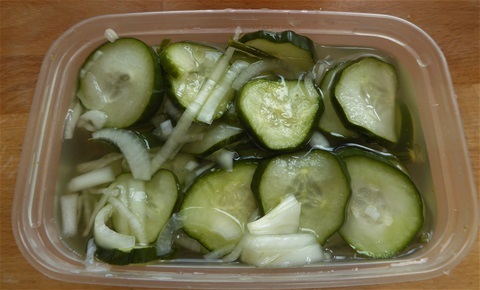 With a glut of cucumbers underway, I was looking for a way of using them up quickly, and remembered this recipe, the original of which was from my friend Sue, to whom I am indebted. It is quick, simple and totally delicious! Once you have made it once, you can easily adjust the amounts for more or fewer cucumbers, as long as it is roughly the same proportions. 2. Cover with a plate and leave to amalgamate for around five hours. Overnight is OK.
4. Pour into a plastic box with a lid, with enough liquid to cover the cucumber fully .. and that's it! PS Someone asked me if the cucumber stays crisp.. it certainly does! Strawberry Pudding Cake, with wonky sides!! 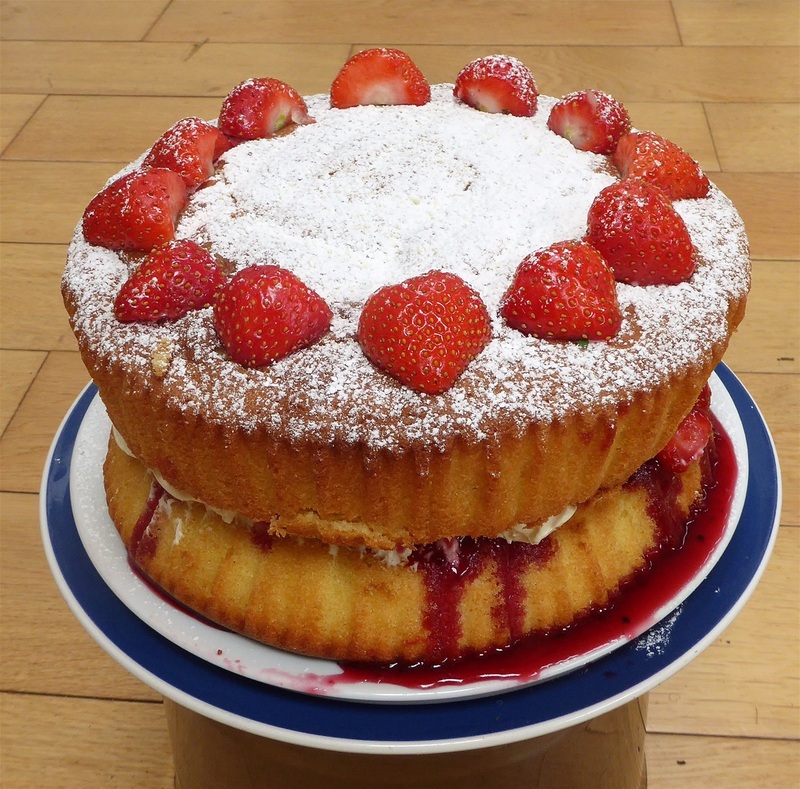 I wanted something a little bit different to the usual Victoria sandwich-style jam sponge, to serve to our visitors yesterday, and after a bit of a think, this is it. 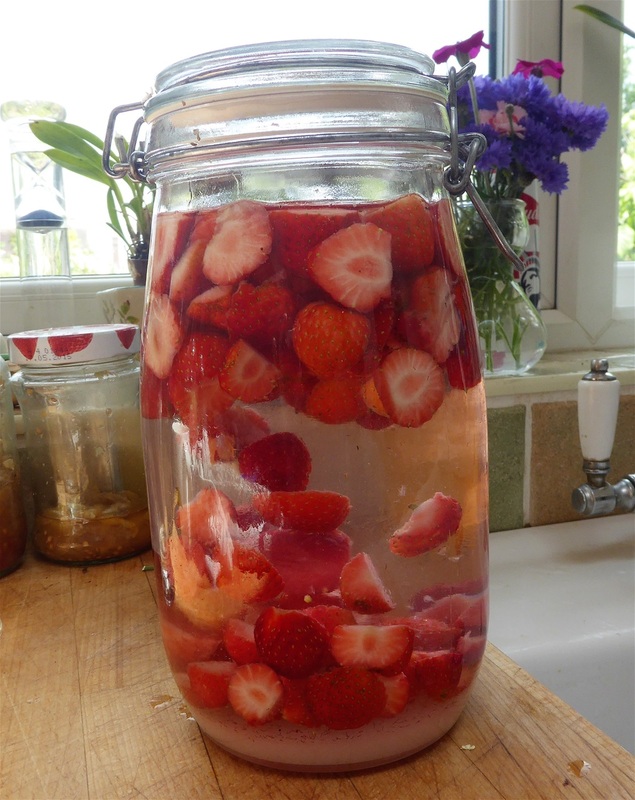 It used the last few of the strawberries from the hanging basket in the garden to excellent effect too. This is a standard sponge mix, but the additional of the jammy filling soaking into the lower cake, lots of which you can see in the photo as it hadn't soaked in when I took this, made it extra moist, and what's not the like about mascarpone cream filling? I didn't have two tins to fit the pre-formed cake liners, so used 8ins tins and each cake was slightly wider at the top than the bottom, but it added to the rustic appeal, or at least that's what I fondly believe. Yours of course, will have straight sides if you use the right sized tins. These pre-formed liners, like giant cupcake cases, are really excellent and save me lots of time in not having to cut and butter baking paper. I shall get some to fit my loaf tins too I think. Makes washing up a doddle too! And there you have it! It slices easily and will provide 8 large or 10 slightly smaller slices. I there is any left, it stores overnight in the fridge perfectly well. You could no doubt vary the fruit, or flavour the cake before adding the flour is you wish, and I daresay I shall be having a go at a Blueberry & Lemon version once we have enough ripe blueberries. 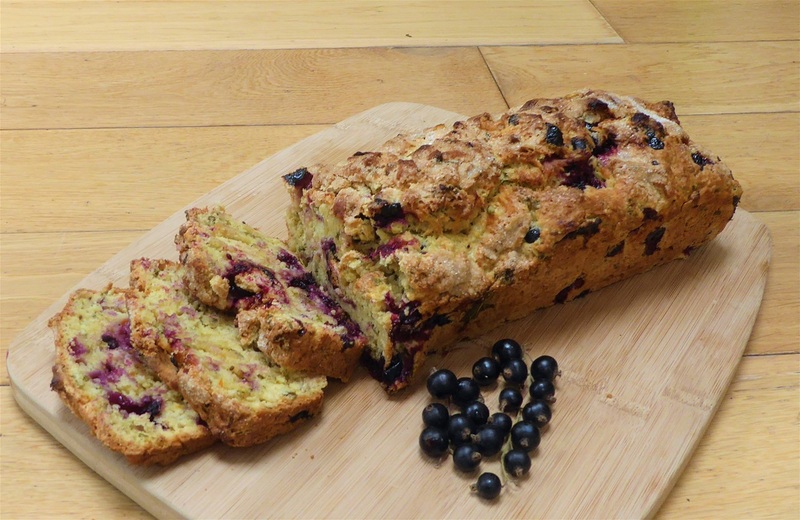 Here are the two recipes I referred to in my blog on Monday, the Roast Broad Bean Crisps, and the Blackcurrant, Mint and Orange Loaf Cake. To be honest, the bean crisps hardly counts as a recipe, although it is useful to have cooking times and temperatures recorded somewhere, for when I need to make some more. The cake is totally scrumptious and is also rather good toasted and buttered I have found! 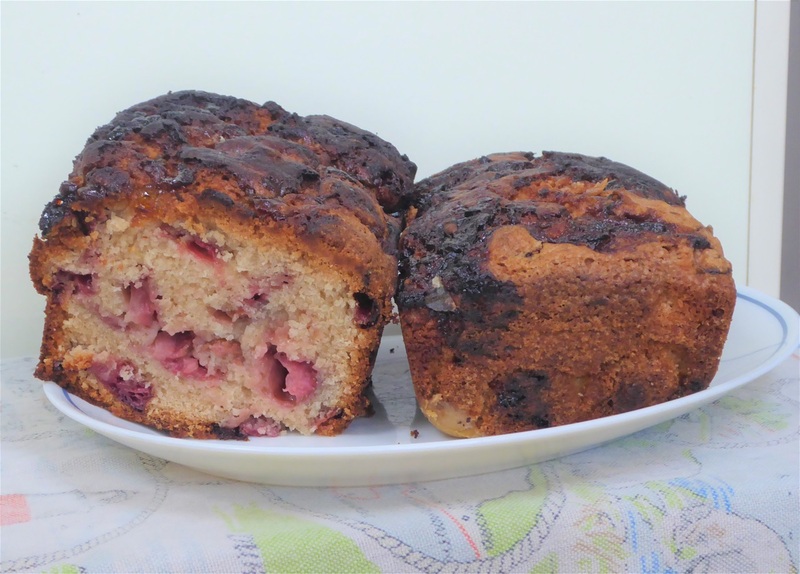 Some of you may be spotting a bit of a theme with my cake recipes... cup and spoons measures mainly, rather than weighing ingredients, but I do use scales sometimes, especially when weighing sugar for jam or jelly! 4. Stir in the orange juice. You are aiming for a "spoonable" mix, not a pouring batter, with no dry flour visible. If there is not quite enough juice, add a little water, just be careful not to make the mix too wet. 5. Spoon the mixture into the tin and level it gently with the back of a wet spoon. Poke down any black currants sticking out to avoid them burning, and sprinkle to top with a little sugar if you like. 7. Cool for 10 minutes in the tin before turning out on a wire rack to cool completely before slicing. The cake lasts at least three or four days if wrapped in foil or kept in a tin, but you can toast it under the grill if you like too. I wouldn't recommend using a toaster in case bits fall in and burn! Half the beans were eaten before I took this photo! 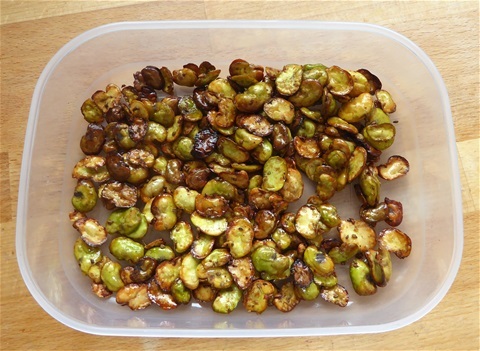 Large broad beans, blanched and skinned... the beans themselves shrink during cooking so small ones virtually disappear: this is a useful way of using those big beasts that have got beyond themselves really. 2. Cook for 30 minutes, turning every ten minutes, until golden brown. 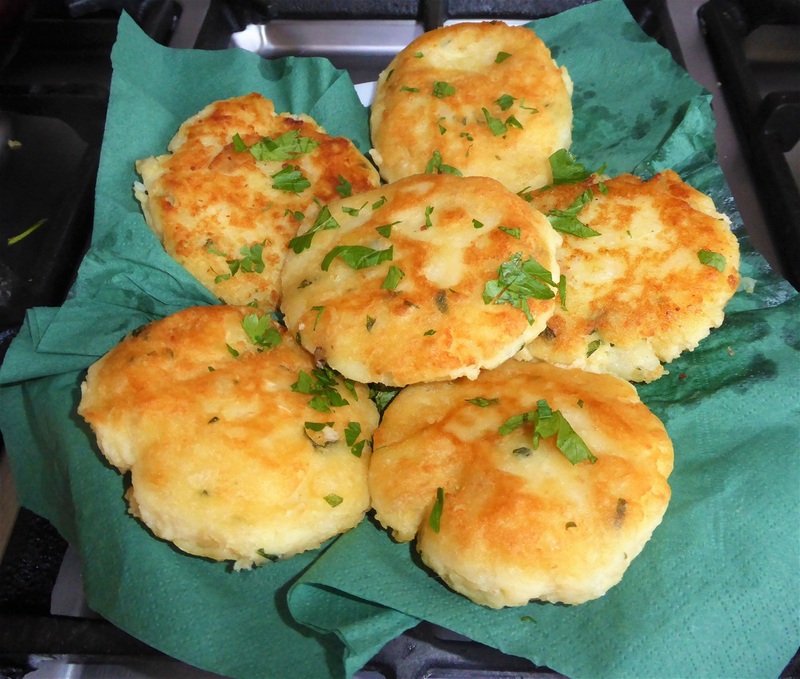 Really, they will probably be eaten quite quickly, as they are very moreish! 1.Put the raspberries and sugar in a saucepan and heat gently until the raspberries are beginning to break up. 2. Sieve the raspberries to remove the pips. This is amazing and unbelievably simple. Just remember it will have raspberry pips in it!! I shall be trying this method using frozen mango chunks from the supermarket as soon as I can, as it really takes just a few minutes to make, plus of course the time for it to freeze. 1. 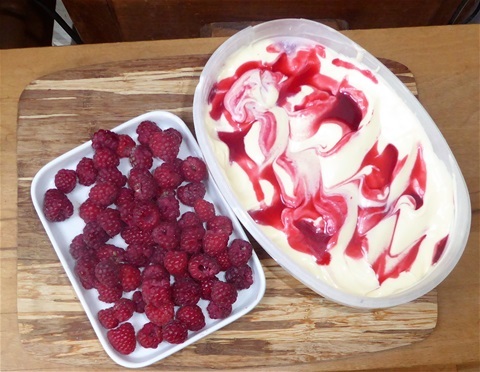 If you have fresh raspberries, open freeze them on a tray before starting to make this. 2. Put all three ingredients in a mixer, either handheld or a stand machine. 5. Freeze the mixture overnight. 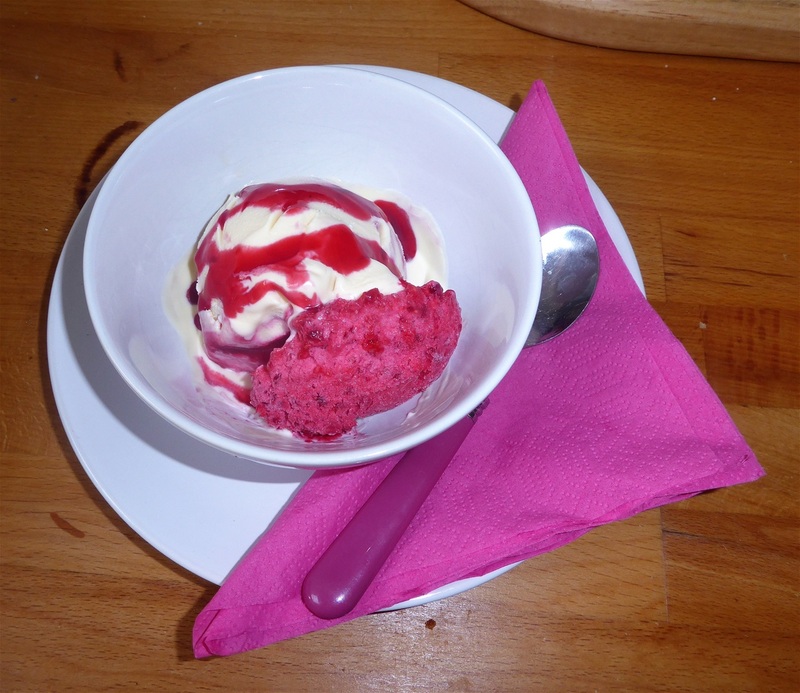 This is such a beautiful colour, and with so few ingredients the flavour of raspberries is crisp and clean. For the first time ever we have a bumper crop of strawberries, well, at least a kilo or two, which for us is a huge crop. Putting cloches over the plants outside has deterred the rodents somewhat and the plants in troughs in the new polytunnel greet us with the glorious aroma of warm berries every morning. I do like a good quick cake recipe and this one turned out so well I am storing the recipe here, and of course you can then share it too! This is another of those "cup measurements" recipes which means it is very straightforward indeed. 6. Divide between the two tins and bake for an hour. One addition could be jam: I used up the odds and ends of a couple of jars in the cupboard, swirling it into the top of the raw cake batter before baking (about 3 tbps per cake) the issue was that I left too much of it exposed to the heat of the oven so it caramelised, which didn't look too good although it tasted fine. Another time I would keep back enough cake batter to cover the jam completely. Here, elderflowers are nearing the end of their season, with lots of flowers dropping their petals and developing tiny green berries. I was lucky enough to find some latecomers that had freshly opened, with lots of lovely yellow pollen still on them, so decided Elderflower Champagne was definitely the order of the day. I last made this many years ago, ago, and it was a disaster as I did not strain in properly and so the bottles developed an unpleasant sediment at the bottom. 4 x 2l very clean empty plastic drinks bottles with a screw on lid ... I have been told that glass bottles are not suitable as they may explode: I am not going to find out the hard way! A large enough container to accommodate the 8l of liquid: I used a large preserving pan, but a plastic bucket would also do. 7. Leave the bottles somewhere cool (not in the fridge) so that the natural yeasts from the flowers can begin to ferment with the sugar. This results in carbon dioxide bubbles and you will see these streaming up inside the bottles. The lids are left loose so that this gas can escape. If the bottle start to bulge, then very slowly release the pressure by undoing the lid slightly more. Standing the bottles in a deep plate to do this saves a mess in case any liquid bubbles over. 8. After about 10-12 days, bubble production will slow down and the lids can be screwed on tightly to build up some fizz in the drink. 10. After a week, it is ready to drink. Open the bottles carefully! It does keep well in the fridge, until the strat of the next elderflower season I have been told, but I don't think ours will be around long enough to find out! And that's it!! It is so delicious it is hard not to eat it with a spoon to be honest and I had to wrest the bowl back from my neighbour two doors down, who came round for a chat. This amount feeds two generously, provided no-one has eaten too much before it gets onto the pasta of course. It sits happily in the fridge for a few days, with a little oil on the surface to stop it drying out. Best to cover it tightly though or your whole fridge will smell of garlic for sure! 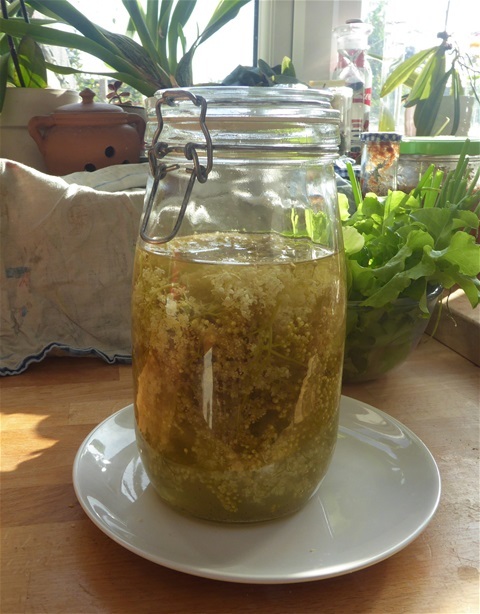 As the Elderflowers begin to open, I start to dream of all the lusciousness that can be created using them. Last year's "bests" were Elderflower Cordial (of which we still have 2 litres left) and Elderflower Gin. As we have so little of this remaining it is top of the list to make, and as you can see, the first batch is in and doing! This is such a simple recipe but the outcome is so delicious you will want to make more than one batch. 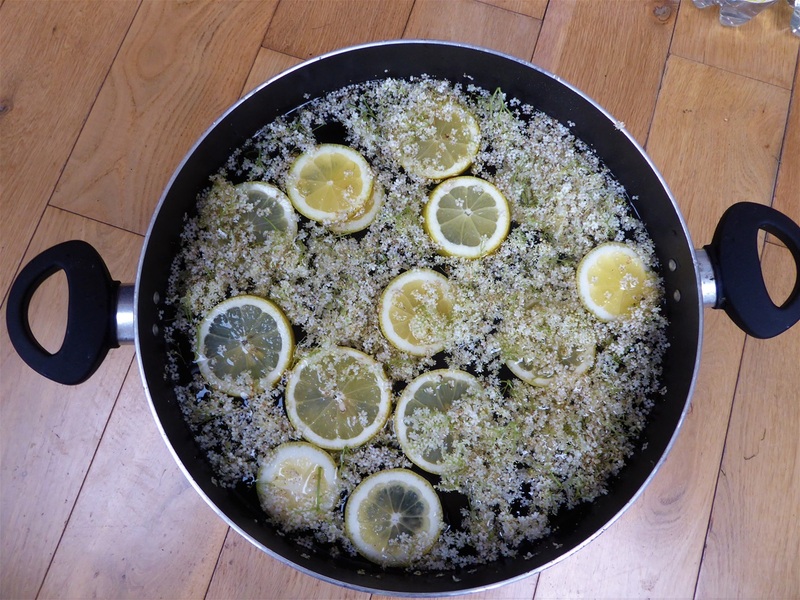 Elderflowers have such a short season that if you want to taste the results first, you'll have missed your chance, so pick some more and freeze them in a thickish plastic bag : they'll last as good as fresh for a couple of months easily. I am fortunate in having Elder trees on our allotment site, a long way from a road or railway track. Just be mindful of foraging anywhere the blossoms might be heavily polluted. 6. Put the jar in a cool dark place and leave, shaking every day, or as often as you remember. It is fairly forgiving. Now at the point some people tell you to leave it for a week, some for a month, but from experience I found about two months to be good. You can of course use this as the perfect reason to have to keep tasting it! And that's all there is to it! You can substitute vodka for the gin if you wish, although personally I love the combination of the juniper/herby flavour of the gin with the musky elderflower. Drink neat with ice or diluted with tonic or fizzy water. Just gorgeous! 4. Add the paste from the blender, and continue to cook until the oil begins to separate out. 5. Add the yoghourt. Stir until the yoghourt is incorporated into the sauce, and the oil is seen around the edges. Takes about 5 - 6 minutes. 6. Now put on the lid and cook on a low heat for a further 10 minutes, Take care that the sauce does not stick, adding a spalsh or two of water if needed. The sauce should be thick though, not watery. 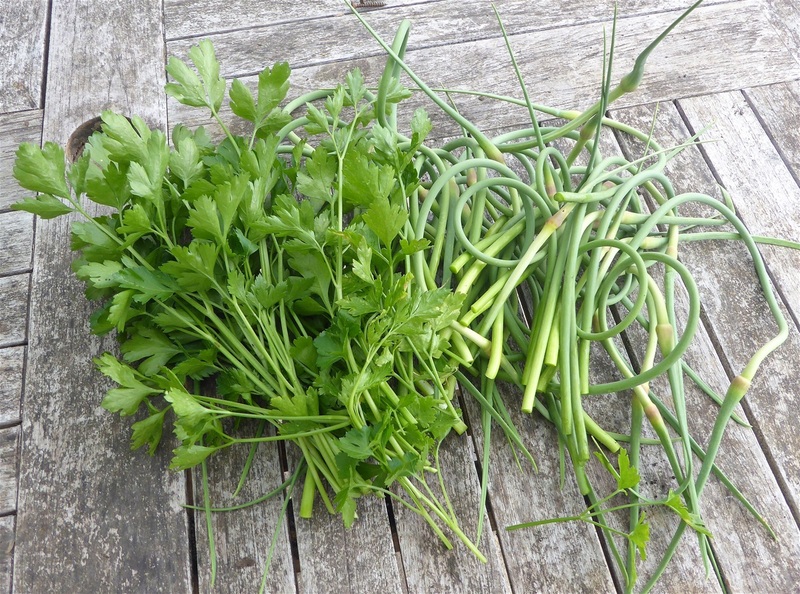 The coriander does lose some of its beautiful green colour during the cooking process, although not its flavour. Before serving, sprinkle some freshly chopped coriander over the dish to add an extra zing. If serving with plain rice, make sure the sauce is not too thick to mix with the rice, but if serving with chappatis (our favourite) or naans, the sauce does need to be thick enough to cling to the meat. 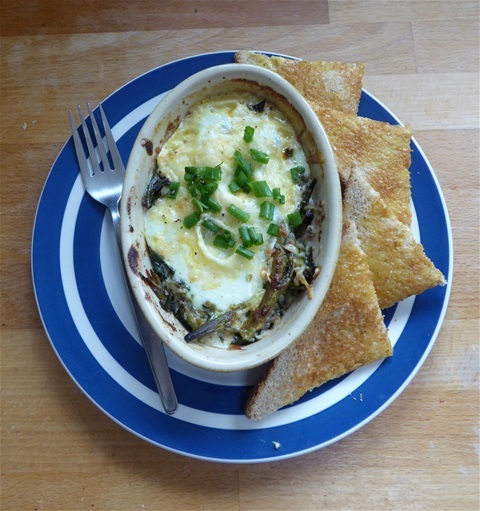 This is another way of using wild garlic leaves in their short season, together with purple sprouting broccoli. 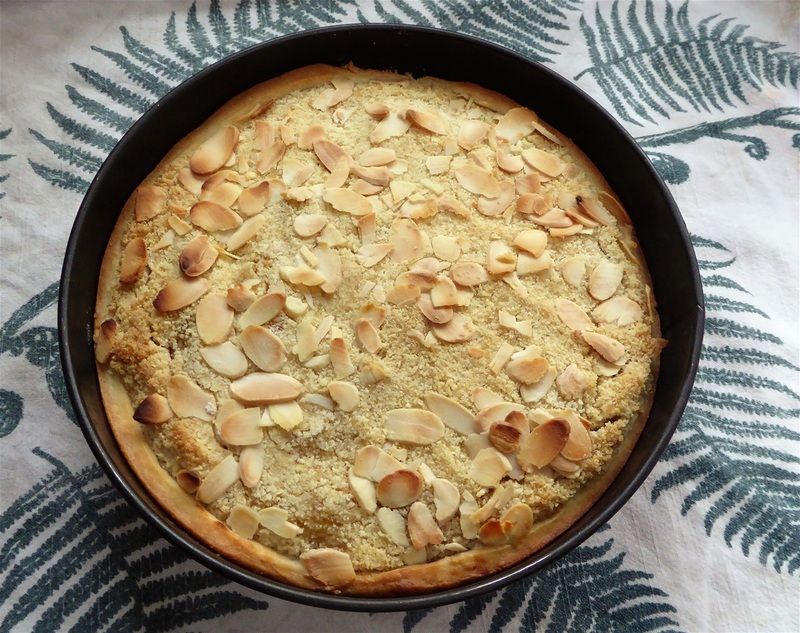 Our PSB has been so prolific I have been glad of another way to use some of it, really. 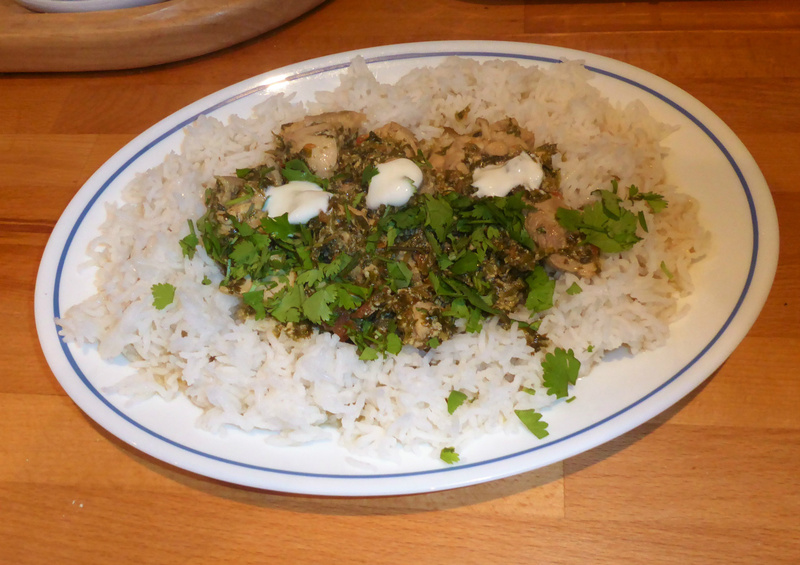 If you don't have wild garlic leaves you can substitute spinach, and having made both versions, they are both delicious. 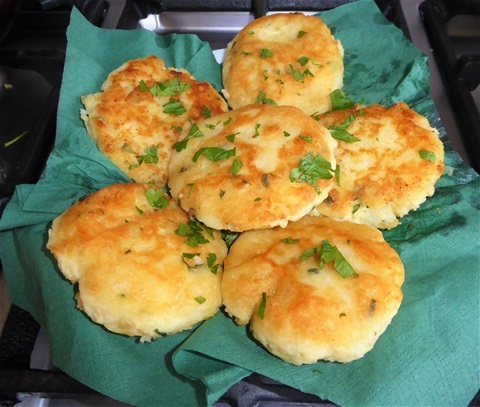 This does not need precise amounts of vegetable, so vary these depeending on taste. You could omit the leaves altogether of course! This can be served in the dish, with buttered toast on the side, or alternatively cooked in one dish without the egg as a side dish to serve with roast dinner or with fish. 2. Weigh out the flour directly into the mixing bowl, add the salt and baking powder. 10.Bake for 12-13 minutes and then cool on a wire rack. They will be light golden brown underneath when cooked. Totally delicious when warm and buttered, and will keep in a tine for a day or two. 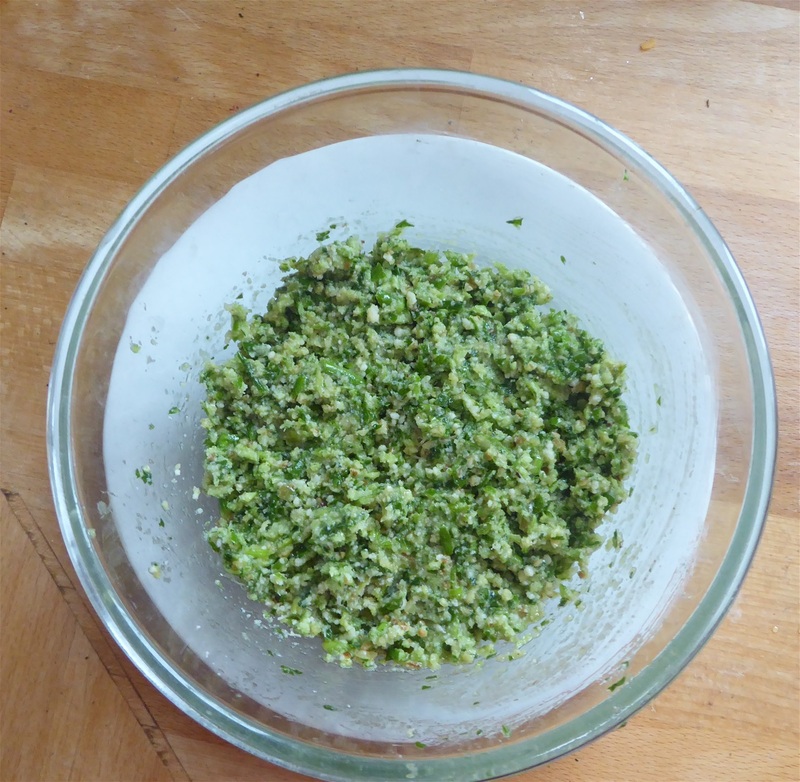 Using the method of keep returning the scales to zero before adding the next ingredient means you are left with little washing up. 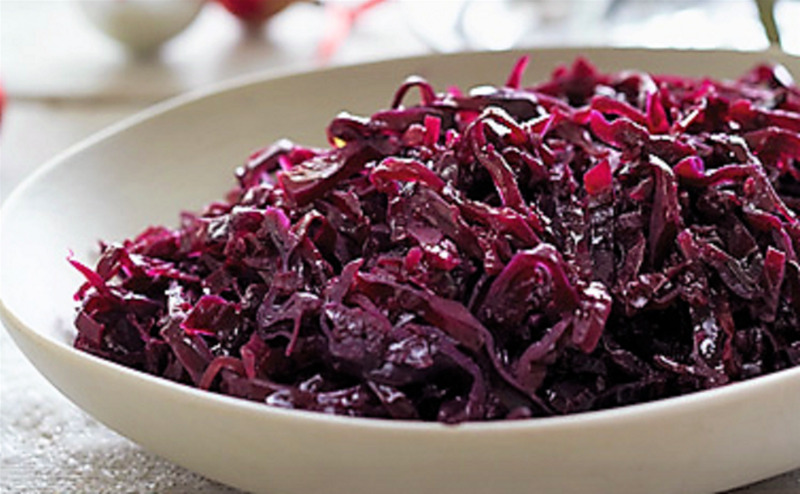 You can make these start to finish in less than 20 minutes!